Tex-Guard is a pigmented, water based 100% acrylic coating available in a matt finish. It consists of high quality tint bases, formulated using premium water based pure acrylic binder, titanium dioxide pigment, quality mineral extenders, proprietary additives and a powerful fungicide. 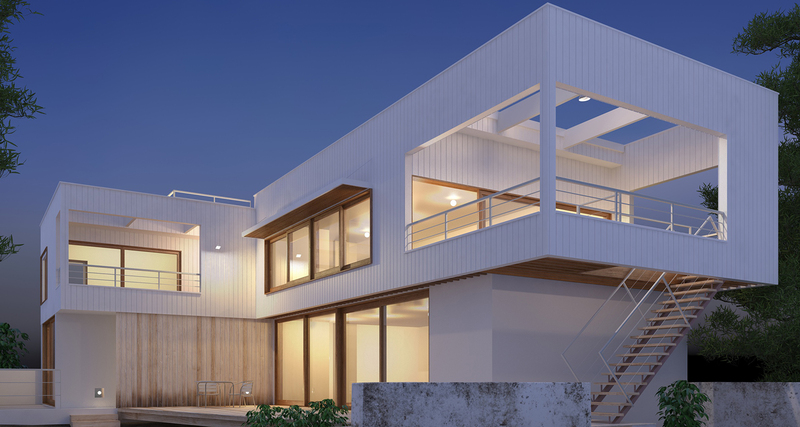 It is part of the CovaWall® Coating System. Tex-Guard is used as an Exterior Protective Finish coat for the CovaWall® Coating system and as a durable exterior coating for various masonry substrates. It substantially promotes the overall coating system durability & ensures greater colour consistency, especially over large areas. It significantly improves washability, reduces dirt accumulation, pollution and chemical attack especially on high profile textured coatings. The product is supplied as tint bases to distributors and in tinted, ready to use form to end users. Excellent resistance to UV, weathering, carbon dioxide & chloride. Abrasion – Very good resistance to abrasion. Acid – Resists dilute acids. Ensure the texture coating is completely dry, especially during winter. The textured surface should be clean and of uniform texture and appearance. Areas not to be coated should be masked and protected. All surfaces to be coated must be clean, sound, free from contaminants including; oil, mould release, dust, dirt, silicone, mud, grease, salt, efflorescence, animal droppings and any loose or flaking material. All substrates other than freshly applied texture must be primed, normally with JPS Primer. Where substrates are chalky &/or prone to dusting, JPS Gripcoat must be used. Tex-Guard for substrate preparation before use. Dry film per coat: Recommended 67.5μm. Colour ~ Can be machine tinted to a dark colour range or factory tinted to order. Toxicity ~ Lead free. Dry film is non-toxic and conforms to AS1647. Shelf life (unopened pails) ~ 24 months maximum from date of manufacture. Shipment Name: Not dangerous goods. No special transport requirements. Storage: Store in a cool place with lid pressed in, above 4°C, do not stack more than three high. JPS Coatings cannot accept responsibility for variations in colour, strength, appearance, product quality or workability etc resulting from on-site mixing procedures and substrate conditions. 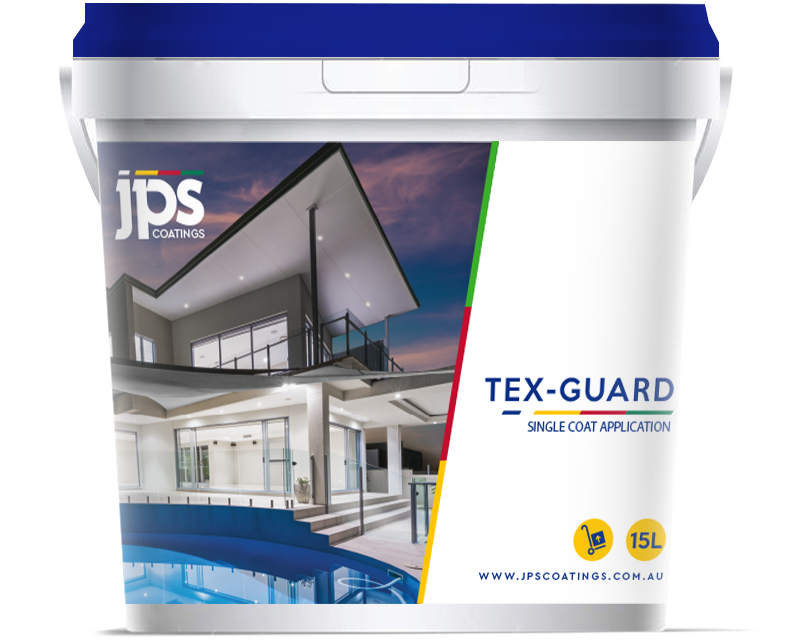 Tex-Guard may be applied by brush, roller or airless spray. A 10-20mm nap roller is used depending on the type of texture or surface being coated. Typical Airless Spray set up is: Graco Ultra 500 using 0.021 – 0.023 spray tip at approx. 2500 psi. If using a roller, roll the coating in one (1) direction only, to avoid cross masking of layers. Brush and roll at the same time to avoid picture framing. After use clean up all equipment with water when product is still wet, do not let product dry on equipment. Dry product will require hot water to scrape and clean or paint stripper to remove off surfaces. Avoid application in full sun or hot, windy conditions. Apply at recommended spreading rate to ensure optimum performance. Avoid inhalation of the vapour, prolonged skin contact and particularly eye contact. Wear protective clothing to minimize skin contact and wear goggles where splatter is likely. Where spills occur, soak up liquid spillage with sand/sawdust and dispose of in a sensible manner. Do not permit run-off to sewer, storm water or open bodies of water. Full pails are HEAVY. Wear protective footwear and seek assistance if necessary. Store in a safe place, away from food and drinks. Ingestion: If swallowed, wash out mouth with water. Do NOT induce vomiting. Drink at least two (2) glasses of water. Seek medical attention. Eye: Wash with copious amounts of water for 15 minutes holding eyelid(s) open. Take care not to rinse contaminated water into non-affected eye. Seek medical attention. Advice to Doctor: Treat symptomatically. Appearance: White or Coloured Viscous Liquid. 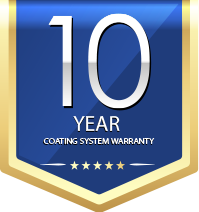 A material only replacement warranty is provided on product performance only when the full complete recommended JPS Coatings system has been applied correctly by a skilled and experienced applicator. If you acquire goods manufactured by us as a “consumer” within the meaning of the Australian Consumer Law, the following also applies. Our goods come with guarantees that cannot be excluded under the Australian Consumer Law. You are entitled to a replacement or a refund for a major failure and for compensation for any other reasonably foreseeable loss or damage. You are also entitled to have the goods repaired or replaced if the goods fail to be of acceptable quality and the failure does not amount to a major failure. The benefits conferred by this Trade Warranty are in addition to other rights and remedies which may be available to you at law including under the Australian Consumer Law and this Trade Warranty does not affect, modify or exclude any such rights and remedies. To claim under this warranty, contact us by phone, mail or through our website’s “contact us” facility, using the contact information printed on this container, giving details, including your contact details. Proof of purchase is required. We reserve our right to inspect the affected property at our cost. Please note, the Statutory Consumer Guarantees set out above do not apply where you acquire our goods for re-supply to someone else or for the purpose of using them up or transforming them in trade or commerce. However, our Trade Warranty will still apply in those circumstances. The information provided herein is considered correct at the time of publication. It is the responsibility of those using this information to check that it is current prior to specifying or using any of the products or coating systems. Any advice, recommendation or information provided by any of the officers of JPS Coatings in relation to goods manufactured by it for their use and application, is given in good faith and is believed by JPS Coatings to be appropriate and reliable.